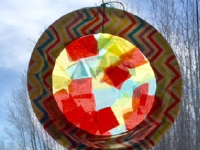 My kids loved making these paper plate sun catchers. I liked that they were able to get creative and design them on their own. 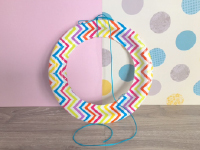 Cut a large hole in the middle of the paper plate and tie a string around the top. Leave a long piece of string so you can hang your sun catcher from the top of a window when you’re done. Cover the hole on the front of the paper plate with clear tape. Cut the tissue paper into small squares. 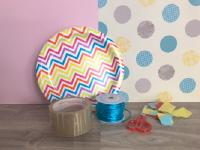 Turn the plate over and start sticking the small pieces of tissue paper on the sticky side of the tape until the surface is completely covered. You are ready to hang your sun catcher in front of a window to brighten up the room. 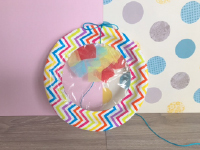 This is such a fun summer craft to do with kids!